Tallinn Art Hall’s exhibition programme can be experienced at three nearby exhibition halls – Tallinn Art Hall (Vabaduse väljak 8), the Art Hall Gallery (Vabaduse väljak 6) and Tallinn City Gallery (Harju 13). For the exhibitions held at Tallinn Art Hall (Vabaduse väljak 8), it is possible to book a free guided tour. Use this opportunity. The exhibition space of the Tallinn Art Hall (Vabaduse väljak 8) is located on the first floor, and it can be accessed by lift. An access card is available from the Art Hall cashier, and the instructions and directions provided by the cashier should be followed. The lift can accommodate a wheelchair with a maximum size of 76 cm (width) x 86 cm (depth). This is a restored and adapted lift that dates back to the time when the building was constructed. The wheelchair-accessible WC is located near the cashier on the ground floor, and its door is 66 cm wide. 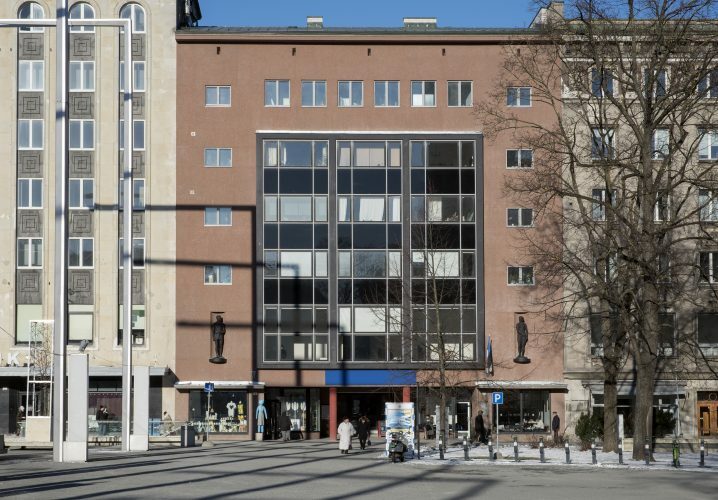 The Art Hall Gallery (Vabaduse väljak 6) and Tallinn City Gallery (Harju 13) are located on the ground floor and are accessible from the street. The exhibition spaces are located 1 minute walking distance from each other.